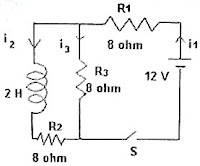 In the circuit shown in the figure, the battery and the inductor have negligible resistance. The currents through R1, R2 and R3 are i1, i2 and i3 respectively. The switch S is closed at t = 0. (a) Calculate the currents i1, i2 and i3 immediately after closing the switch S(when t = 0). (b) Calculate the currents i1, i2 and i3 when steady state is reached. (c) Show the nature of variation of the current through the battery graphically, with time ‘t’ on the X-axis and the current (i1) on the Y-axis. (d) What are the values of the slopes of the above graph at t = 0 and at t = ∞. (e) The switch S is opened and the resistance R3 is disconnected. If the switch S is now closed, what time is required for the current to attain 63.2% of the final steady value? The above question carries 15 points. The division of points among the sections (a), (b), (c), (d) and (e) can be as 4 + 3 + 4 +2 +2. Try to answer the above question within 15 minutes or less. I’ll be back with the answer shortly.